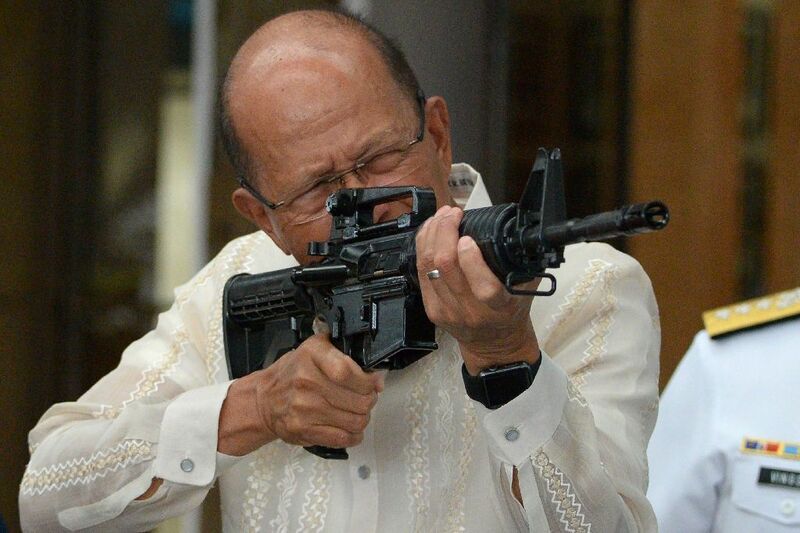 Philippine Defence Secretary Delfin Lorenzana tries a CQ-A5b (M4) rifle donated by the Chinese government during the ceremony at the military headquarters in Manila on October 5, 2017. Manila - The Philippines' military chief hailed the United States as his nation's "number one ally" and announced a return of regular war games, following President Rodrigo Duterte's call for warmer ties. Duterte last week vowed to be "friendly" with the United States, signalling an end to relentless criticism that included a vow to end all joint military exercises and branding then US president Barack Obama a "son of a whore". Military chief General Eduardo Ano, returning from Hawaii where he met US Pacific Command chief Admiral Harry Harris last week, said Thursday the allies had agreed to increase joint military exercises for 2018 after they were scaled down this year. "The president said: 'I want to be friendlier to the US'. So we have a closer relationship and more exercises," Ano told reporters in Manila. "He (Duterte) said to continue engagement with the United States. They are still our number one ally." Ano said the joint exercises next year would focus on counter-terrorism, disaster response and even territorial defence. As he sought to loosen his nation's alliance with the United States, Duterte also looked to build warmer relations with China and Russia. During a visit to Beijing a year ago he announced his nation's "separation" from the United States. He later explained he was angry at Obama for criticising his war on drugs, which has since seen thousands killed and led rights groups to warn Duterte may be orchestrating a crime against humanity. Duterte said last week the dispute was "water under the bridge" as he thanked the United States for helping the Philippines fight Islamic militants who have occupied parts of the southern city of Marawi since May 23. The US has provided intelligence, weapons and training to local forces trying to retake Marawi. The fighting has claimed more than 900 lives and raised fears the Islamic State group is trying to establish a Southeast Asian base in the Philippines. Ano said on Thursday the Philippines would still pursue closer defence ties with China. Ano was speaking at a ceremony at which China turned over 3,000 assault rifles and ammunition worth 168 million pesos ($3.2 million) to the Philippine military for use in fighting terrorism. "The US is not our enemy. China is not our enemy. Our utmost priority is the interest of the country," Ano said. The Philippines' military chief hailed the United States as his nation's "number one ally" and announced a return of regular war games, following President Rodrigo Duterte's call for warmer ties.